If you're looking for a way to wake your brain up either in the morning or at mid day, go for a run. Or do some other activity that gets your heart rate up. I woke up not wanting to get out of bed. It was dark and I hate running in the dark. And I wanted to still be asleep. But I knew that once I got going I'd be glad I did. So I ran and I noticed how awake I suddenly felt after a mile of my run. My mind was firing off different ideas and I was alert and so glad that I went out. And look at this gorgeous sunrise I got to see at the end of my run. There are no filters on this picture. It was unreal. More on the mind/body connection stuff later. 4 easy paced miles this morning and the temperature was perfect. After getting cleaned up and J off to school I had some breakfast. Does anyone else think that bread is one of the best things to eat after a run? This may just be because it's what we always had after races in high school so it's what I'm used to. 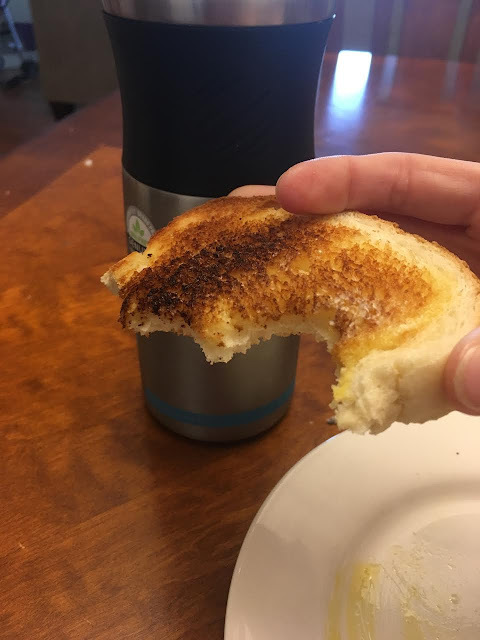 I would have prefered Great Harvest's cinnamon swirl bread but I had to settle for plain old white bread toasted with butter. I also had an egg to make me feel like I was being a little bit healthier. V decided to have yogurt and dry crunch berries for breakfast. 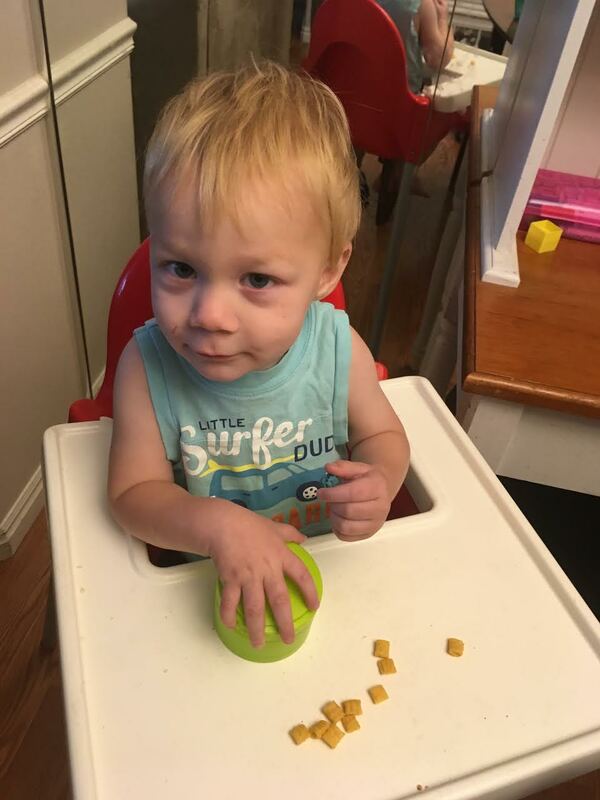 He already knows that the berries are better than the crunch. 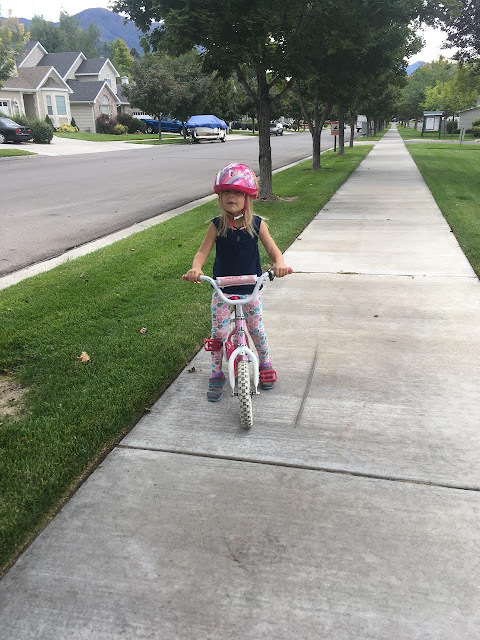 Then M asked if we could go on a walk and she could ride her bike. It was a really nice morning so we went around our neighborhood before we came home to finish up our morning chores. So I want to talk a little bit, today, about the connection between mind and body and how taking care of your body helps you have a stronger mind. There have been a lot of studies that show that exercising for 30 minutes or more a day will help your memory be stronger. This probably comes as no surprise to anyone reading this. I wanted to talk about a different view of this though, the creativity side. I don't have any scientific research to give you on this today other than my own experience but hopefully, you'll at least find it interesting or entertaining. A good amount of my blog content comes to me on a run. Sometimes I'll get home and have a list of 5 or 6 different topics that I want to talk about. There is just something about getting outside, breathing fresh air and seeing the things around you that help you be more creative. It doesn't really matter what time of day you get out and enjoy your exercise in nature (and even if you have to exercise inside, it still helps) but this is something that I found happens more often when I run in the morning VS running at night. I think, for me, running at night my brain automatically goes to the things that have happened through the day. And that can be really therapeutic in some ways but in the morning, my brain isn't worrying about the day's events yet. If I can get out and running before my brain has to function a whole lot I find that I am in a better place during my run mentally. I'm not running off frustration or anger. I'm not thinking about how I yelled at my kids when I shouldn't have. I'm just running and my blood is flowing and more oxygen is going to my brain and the rest of my body and I can think very clearly. Then the rest of the day I'm thinking more clearly, I'm in a better mood, I notice the little things that matter most more often, and I can deal with the stress of being a mom more than on my rest days/night workouts. Plus, waking up early, even if it means starting in the dark, means I get to witness beautiful sunrises. And that is something you can't just witness by looking at a picture. You can see it that way, but you can only witness that by being up and going early enough to watch it. What is something that you do that affects you differently in the morning VS at night?